Punctuation, Grammar & Spelling Editing Experts - Book 1 Beginners/Level 1 ESL. 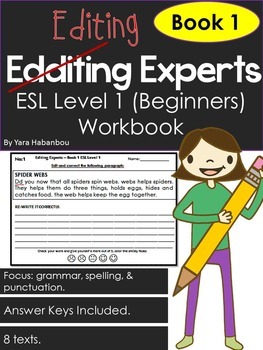 This book was created to help me deliver some morning work/homework to my ESL students while preparing for class or marking. 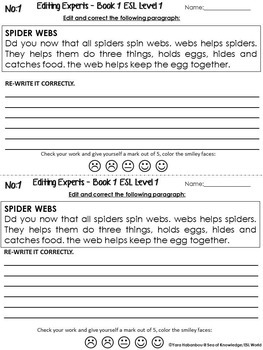 I have included a variety of different types of texts suitable for ESL learners, stories, letters, advertisements etc. These passages suit a low level or per-intermediate ESL class. 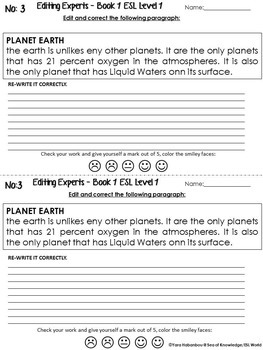 *Each page includes 2 identical paragraphs to save on photocopying, just print, photocopy and cut it in half to hand out to each student.